Will Apple Open the iPhone to Rival Spotify? Listening to a song on an iPhone is a quick, simple process: open Apple's iTunes music player and select the song you want to hear. That's it. But to listen to a track that isn't in your iTunes library  say you just have to hear Billy Joel's "Piano Man" right now  takes a little more time and effort. You have to get on the Web, go to the iTunes Store, find the song you want, pay for it and download it  maybe deleting another song first, if your memory is full  all before you can hit play. If Spotify has its way, though, iPhone owners will no longer be slaves to iTunes, song-by-song payments or finite disk capacity. Last week the Swedish company behind Spotify's streaming music provider announced plans to release a free iPhone application that will let users listen to songs played directly off of its online service, with no need to download. That would give iPhone users instant access to any of Spotify's 6 million songs, without taking up precious memory space  way more than the maximum 7,000 tracks that a 32 GB iPhone can hold. Songs can also be temporarily stored, or cached, ready to play during those moments when Web connection drops, like when you're in a tunnel or underground. Spotify's new application could change the way iPhone users listen to music. But first it has to get the O.K. from Apple. Spotify has been gaining popularity in Europe since its launch in 2006. The peer-to-peer program, which lets users share music from their own collections with other users, is considered one of the top music-streaming sites thanks to its huge library of songs, which play with almost zero buffering delay (that annoying choppiness that can make streaming songs  or video or TV shows  particularly frustrating). Add to that the fact that Spotify's basic service is free  advertising pays for artists' royalties  and it's easy to see where it gets its approximately 6 million users. But the service's lack of portability has meant that most music fans still prefer downloading songs, sometimes illegally. Now Spotify wants to make streaming mobile. The new application won't be available to everyone, only those who opt for the premium service, which costs $15 a month for unlimited streams (the same amount buys you about 15 songs from the iTunes Store), access to prereleases and better audio quality than the free service, which forces users to listen to ads after every few songs. Spotify says it can't reveal exactly how many of its members are currently using the premium service, but spokesman Jim Butcher says recent developments, such as the CD-quality streaming, are driving uptake. Spotify hopes to have its new application available on the iPhone within the next few weeks. The trick is getting Apple to approve an application that some observers see as a potential challenger to Apple's own iTunes music player, which iPhone owners use to listen to their downloaded tunes. "Apple has made it clear in the past that iPhone apps should enhance the experience, not compete with its core functionality," says Mark Mulligan, a London-based analyst with Forrester Research. But Spotify doesn't see itself as a rival to iTunes, mainly because it feels that it offers a service iTunes can't match. "We honestly don't think there is a direct competitor to Spotify, as no one's doing exactly what we're doing at the moment," Butcher says via e-mail. "We're confident that Apple will allow the Spotify app, as we think it will improve the iPhone users' experience even further." As for Apple, it has yet to comment. 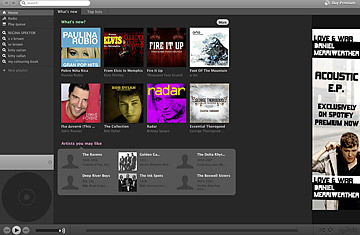 The company has allowed other music-streaming applications, such as Pandora and Last.fm, onto the iPhone. But they work more like radio stations, without the control, choice and instant gratification that Spotify users enjoy  all the things that could make Apple reluctant to give the service space up against iTunes. To try to win over Apple, Spotify will no doubt argue that its service could drive people to download more songs from the iTunes Store and even increase sales of iPhones. That Spotify is going ahead with its plan to launch the application before the official O.K. from Apple is either a sign of supreme confidence or savvy publicity. "Spotify are masters of utilizing the Web to drive buzz and consumer interest," says analyst Mulligan. If the company does get the nod from Apple, it will be just the first step in the company's quest to get the world streaming. There's also a Google-based application for non-Apple phones in prototype and a plan to launch the regular Web-based application in the U.S. before the end of the year. But if Spotify helps streaming catch on and music fans get used to the idea that they can listen to any song they want whenever and wherever they want, what will happen to music ownership? Why bother clogging up your disk space when every track you can think of is just a few clicks away? Spotify's Butcher thinks there's plenty of room for both streaming and downloading in music lovers' lives. "People like to consume music in a variety of different ways," he says, pointing to the enduring popularity of vinyl as proof. "Some music fans will continue to prefer ownership of their music, while others will be happy with access to millions of tracks." Whether you'll soon be able to do both on your iPhone all depends on how Apple reacts to this latest killer app.